Years ago Tim LaHaye and Jerry B Jenkins wrote the Left Behind series which, at the time, became the bestselling series of all times. People were intrigued by the end times(apocalypse type stuff–now zombies seem to be the thing), but I also believe people read the novels in search of answers. Maybe you’re asking yourself those questions. On January 20, 2013 my Pastor preached on the subject. The title of his sermon was “The Fulfillment of all the Signs of His Coming.” If you’re one of those with questions, I urge you to listen to find out if we’re living on the edge of destruction? By the way, my son came home after the sermon and said, “That was his best sermon yet.” (My son says that just about every Sunday–I’m glad he’s listening). The gremlins in the computer took away the right video for this post, and I can’t seem to get it fixed. So, here is the link. You’ll have to click over to youtube to view it. My apologies. I ran over the Duke University Rowing team–thus fulfilling an item on my bucket list. I cross over Lake Michie (pronounced like the mouse) every day on my commute in to work. So every morning I watched for that perfect opportunity to meet my goal. And then one glorious morning, the Tuesday before Thanksgiving, the skies were gorgeous,the sun was shining and the rowers were rowing their little hearts out. I thought, this is my opportunity, if I slowed down enough I could time my crossing with their crossing. (Sorry to those folks driving behind me, but it had to be done) And, sure enough, it happened. I ran over them. I couldn’t wait to tell people at work (and confirm to them my insanity). Yesterday, I saw the opportunity, pulled over on the side of the road, pulled out my iPad and snapped the shot you see above. If I could have been on the bridge, the picture would have been so much better. 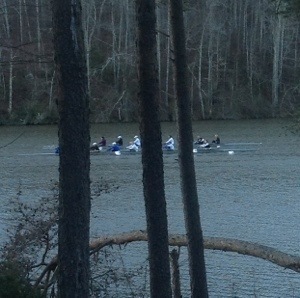 Anyway, to you lady Blue Devil rowers, I’m sorry I had to run over you. But it looks like you survived.